Alameda County, CA--On Sunday, August 26, 2018, at 12:20PM, the Alameda County Fire Department (ACFD) and CAL FIRE responded to a report of a vegetation fire in the area of the 6500 block of Palo Verde Road in Castro Valley. The fire, known as the Palo Verde Fire (or Castro Fire per CAL FIRE), burned 48 acres of unincorporated State Responsibility Area (SRA) land and is 100% contained. 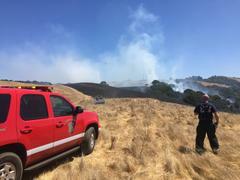 The overall management of the fire has transitioned from the ACFD to CAL FIRE. ACFD crews have been released from the incident and CAL FIRE crews remain at the scene. A quick and coordinated response from many agencies throughout the area responded to battle the blaze from the air and on the ground. Cooperating agencies included the Alameda County Regional Emergency Communications Center, California Highway Patrol-Castro Valley, Livermore-Pleasanton Fire Department, San Ramon Valley Fire Protection District, Fremont Fire Department, Alameda County Sheriff’s Office, Paramedics Plus and PG&E. There were no reports of injuries to firefighters or community members. No structures sustained any damage. During the initial phase of the incident, resources were also staged on Dublin Canyon Road and Palomares Road for structure protection if needed. Once the forward progress of the fire was stopped, units were released. The cause of the fire is under investigation by CAL FIRE.